Bad news, San Francisco. 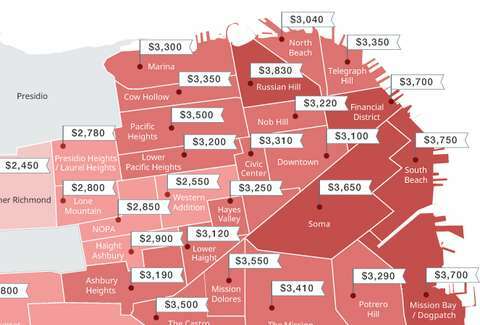 Just when you thought the rent couldn't get any damn higher, it did, and real estate site Zumper made a map to prove it. 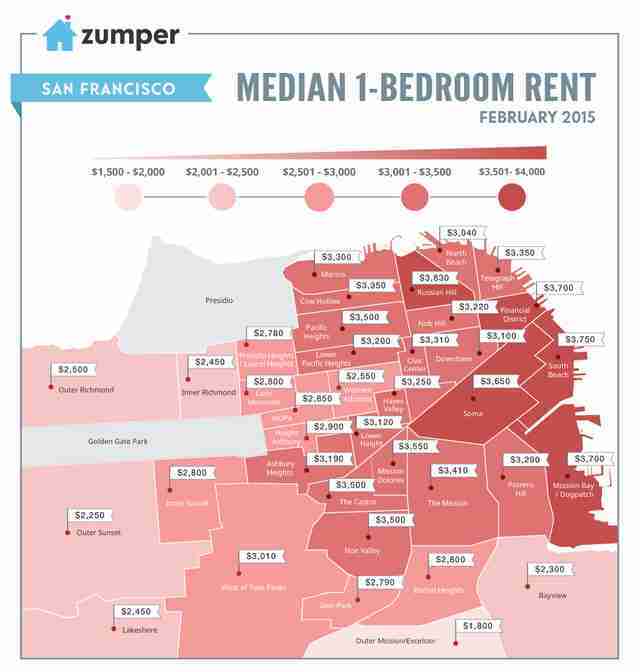 Specifically, the map shows just how high the median rents per neighborhood were for a 1-bedroom apartment in February ... and it's not pretty. Unsurprisingly, rents were the highest in neighborhoods like South Beach ($3,750), Mission Bay ($3,700), the Financial District ($3,700) and SoMa ($3,650) -- all of which are terrible neighborhoods you should never, ever live in. Russian Hill took the top spot, with a median rent last month of $3,830, and that's down 4.3% compared to recent months, according to Zumper. Other outrageously expensive parts of town also saw slight dips in rent, like Pacific Heights and Nob Hill, but they're still ridiculously expensive. Worse yet, the overall median rent for a one-bedroom in the city broke a new record at $3,460 and topped Zumper's list of the most expensive cities to rent in for the ninth month in a row, beating out New York City's terrible rents and Los Angeles' not-that-expensive and actually kind of quaint rents. In fact, the site reported rents have continued to rise in San Francisco, going up 1.3% month over month and even 3.3% over the last quarter. For perspective, the median for a one-bedroom in NYC was $3,000. Isn't New York supposed to be worse than San Francisco? Well, at least in every other category it still is. Tony Merevick is Cities News Editor at Thrillist and thought the rent in New York City was stupidly high, and can't even imagine San Francisco rent. Wow. Follow him on Twitter @tonymerevick.